With news of the surprise retirement of Delegate Onzlee Ware, the citizens of 11th district in the city of Roanoke will have an opportunity to elect a new legislator to serve them in Richmond. I’m pleased to say that fellow liberty activist Caleb Coulter will be seeking the Republican nomination for this office. I have known Caleb for several years and believe that he possesses both the principle and integrity that are sorely needed in all levels of government. That’s why I was glad that he was elected to represent me as a delegate to the Republican National Convention at Tampa in 2012 and also why I believe he would make an excellent candidate to serve the citizens in our state government. The Republican primary for the 11 district will be held in just two weeks, on December 10th. Therefore, I strongly encourage you to visit his campaign website and his Facebook page now to learn more about him and ways you can help him become a delegate. Saturday marked a political first for me (given my 18 years active in politics, firsts aren’t all that common anymore). I attended my first state central committee meeting of a political party. It has been my experience that the Republican Party doesn’t typically advertise their meetings of their state central committee; by comparison, the Libertarian Party not only posted their meeting on Facebook, but they also invited non-committee members to attend. Shortly before noon, Nick (the leader of JMU’s Madison Liberty) and I made the trek from Harrisonburg to downtown Charlottesville for the 1 PM meeting. The upstairs room which held the SCC was packed. I was told that this gathering was the largest that the party had ever seen outside of one of their conventions. Besides the leadership of the Libertarian Party, there were a multitude of other familiar faces including Robert Sarvis and former House of Delegates candidate Jonathan Parrish. 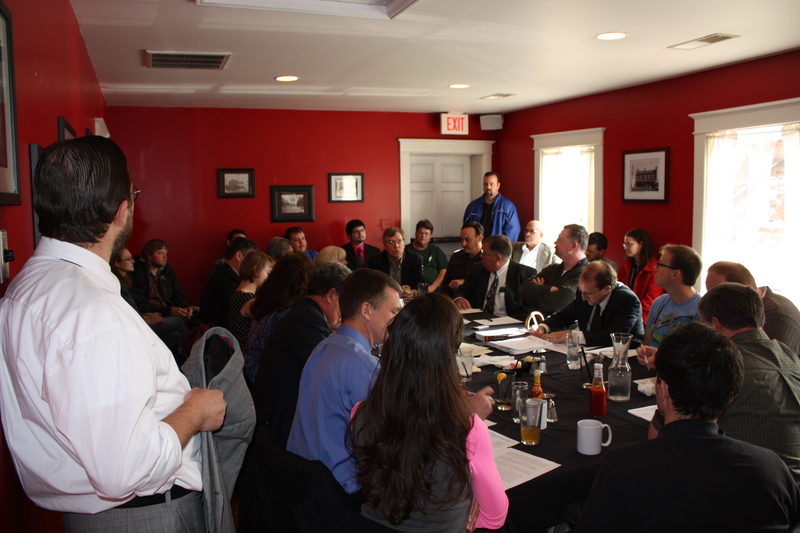 The Harrisonburg/Rockingham liberty community was well-represented, with at least seven attendees in the audience. Although not a member of their party, I was permitted to witness the proceedings. Major points of business for the group included discussing plans for the 2014 Libertarian Party Convention, tentatively slated for February 8th in Richmond, and issues dealing with the Tidewater Libertarian Party. Before the November 5th election, the leader of the TLP endorsed Ken Cuccinelli for governor over Libertarian Robert Sarvis and several members of their leadership had made statements either favorable to Cuccinelli or disparaging of either the LPVA or Robert Sarvis. Although the TLP removed the head of their group in response, some LP leaders wished to disaffiliate the TLP with the state organization. Unfortunately, as the discussion grew heated, Nick and I had to leave as he needed to travel to northern Virginia for Thanksgiving break. However, after dropping him off in Harrisonburg, I turned my car around and returned to Charlottesville. Being the political animal that I am, I found the discussion far too intriguing to simply abandon it. However, by the time I returned, the meeting had concluded. Nevertheless, the social that followed was worthwhile and I relished the chance to speak with Robert Sarvis, fellow former RLC-VA board member Steven Latimer, Roanoke Libertarian leader Melissa Scott, 2013 House of Delegates candidate Laura Delhomme, LPVA secretary Marc Montoni, LPVA vice-chairman Dr. Lark, as well as meeting several new folks. I heard that although the vote was close, the LPVA decided to maintain ties with the Tidewater Libertarian Party. Although it ended up taking about four hours worth of travel time and gas, I was glad for the opportunity to spend Saturday afternoon and evening with Libertarians from across the state. It was nice to finally meet quite a few people whom I’ve only had contact on Facebook. On a non-political note, I’m pleased to announce that today marks my one year anniversary of attending the RISE church in Harrisonburg, Virginia. Although the reasons which first brought me to this faith community no longer keep me there, during this last year I’ve found an incredible group of individuals including Amanda, the amazing pastor of RISE. We’ve had our share of joy and sorrows, our challenges and our triumphs. We’ve laughed, we’ve cried, we’ve learned, and we’ve grown. Although we come with our own histories and stories, we are bound together as brothers and sisters in Christ. Although I’ve invited you before, for those who live in the Harrisonburg area looking for a church, perhaps RISE would be a good fit for you. Maybe I’ll see you next Sunday at 10 AM at the Court Square Theater. Or if you’re not into that whole Sunday morning thing, you could try Tuesday nights with RAISE. On Wednesday morning, I decided to travel to my alma mater, the College of William & Mary in Williamsburg, Virginia. 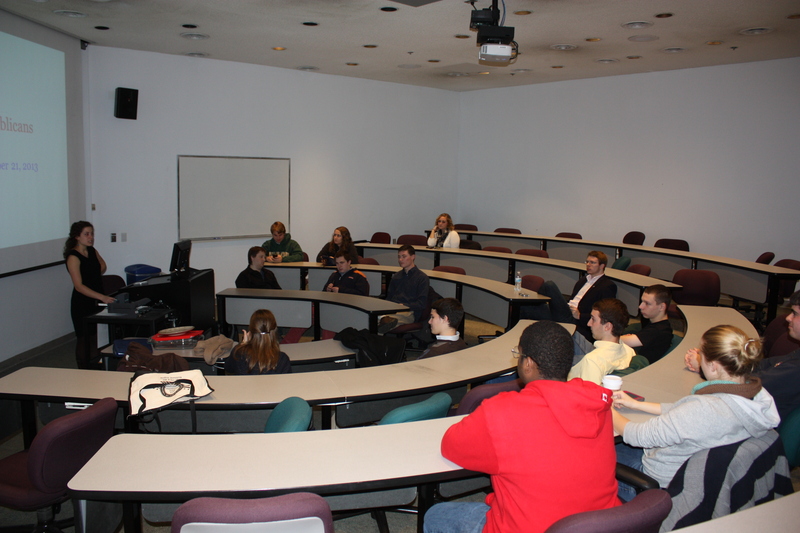 As part of my journey, I hoped to meet with William & Mary Students for Liberty that evening. While on the grounds, I decided to stop in to the office of student activities to discover what sort of political organizations existed on campus. Besides the aforementioned Students for Liberty and the fairly traditional College Republicans and College Democrats, I also discovered William and Mary Students for Life, a pro-life group created by my former employers, Students for Life of America. After a few email exchanges, I ended up attending a meeting of this organization. Although the local Catholic church held a pro-life event at the same time, as thus lured away some of their attendees, Students for Life still had a pretty good gathering. Even though I planned to leave campus on Thursday afternoon, when I heard that Pete Snyder would be speaking to the College Republicans, I decided to stick around, interested to hear what Pete had to say and to offer him a friendly hello. Unfortunately, several minutes before the start of the CR meeting, the leader of the group announced that Mr. Snyder was unable to attend. It was disappointing and cut their meeting pretty short, but these things do happen. Nevertheless, despite the statewide losses and the defeat of Delegate Watson in the 93rd, the CRs seemed to be in pretty good spirits. Although not an exhaustive search, I’m glad to see that political activism is still alive and well on the campus of William & Mary. “Two roads diverged in a yellow wood.” So begins Robert Frost’s immortal poem and so too the liberty movement in Virginia now faces two or more roads. Nowhere can this divide be seen more clearly than in the 2013 race for governor where many liberty activists supported Republican Ken Cuccinelli and others rallied behind Libertarian Robert Sarvis. As attacks mounted, each side grew to despise the other. The question now becomes what should be done? Many people declared that the Republican ticket of Cuccinelli, Jackson, and Obenshain was the most liberty-minded statewide slate of candidates Virginia had ever seen. However, Cuccinelli and Jackson both fell in defeat and Obenshain is a few votes behind Herring; at this point, that contest and the recount to likely follow isn’t terribly promising. On the Libertarian side of things, although Robert Sarvis performed leaps and bounds better than Gary Johnson’s presidential run in 2012 or Bill Redpath’s 2001 gubernatorial race, he was unable to reach the 10% mark, which would have given tremendous legitimacy to the Libertarian party and awarded them official status within the two major parties in the state. Some of my fellow liberty activists remain firmly committed within the Republican camp, arguing that taking over the GOP is the only realistic hope for liberty. However, there are grumblings within the establishment of that party, whether fairly or not, using 2012 as an example of what happens when the party drifts too far from the center. Although perhaps mere rumors, there is talk of expelling the tea party and the liberty movement from their ranks. And, given the proclivity of some Republicans to pass massive tax increases and meddle too much into personal affairs, an increasing number of libertarians see the GOP as a major part of the problem. Others declare the Libertarian Party to be the path of the future for liberty. 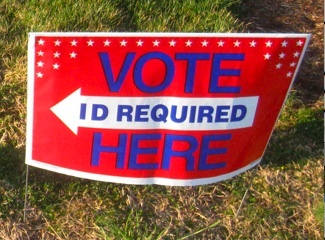 However, given the party did not achieve its 10% goal, it still faces significant hurdles both electorally and, just as important, the wasted vote syndrome embedded within the minds of scores of Virginia citizens. The party is still quite small and underfunded, thus the challenges are enormous. And some of their positions are unpalatable to liberty-minded social conservatives. As you likely know, during this election cycle I looked at the choices and was…“sorry I could not travel both”; ultimately taking “the one less traveled by”. Like I stated as the campaign cycle began to take a particularly nasty tone, one of my greatest concerns was the rift in the liberty faction. The Republican wing considered the Libertarian to be fools, wasting their time on a candidate and cause that clearly could not win, while the Libertarian wing thought the Republicans to be sell-outs, supporting candidates who did not really adhere to the message of liberty. For those who missed today’s political radio hour on 550 AM WSVA, you can now find it online here. The discussion mainly centered around the outcome of last week’s 2013 election, though there was also talk of Obamacare. Today, we take time from our busy schedules to remember and honor the veterans who fought and died on behalf of our nation and our liberty. In the spirit of the day, I took a trip to a small community in Rockingham County near the West Virginia border known as Briery Branch. In many ways, it was a return home. I lived in this area from the ages of two to six and, at one point, both sets of my grandparents lived there. 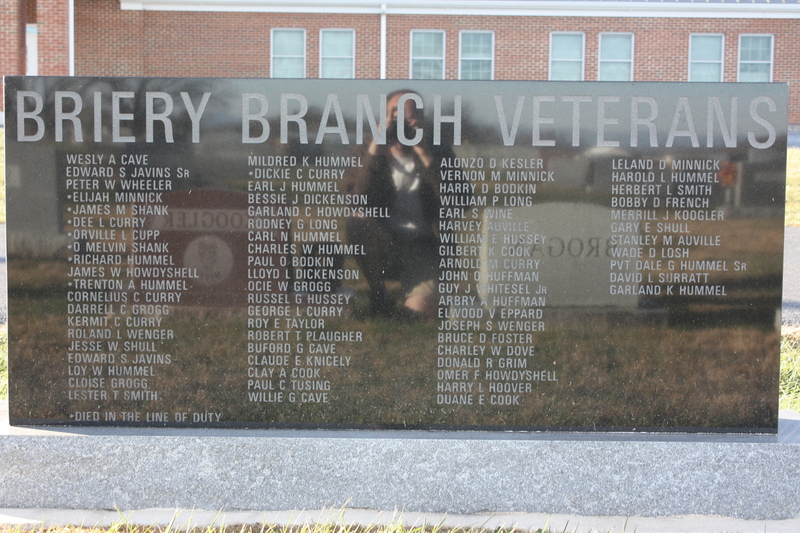 In remembrance of Veterans Day, I spent some time at the cemetery of the Briery Branch Church of the Brethren. In it, one can find the graves of a multitude of veterans, including several of my own relatives. In recognition of their sacrifices, I’d like to take a moment to remember my grandfathers who served our nation in World War II as well as a great uncle who gave his life at the age of twenty-nine, leaving behind his wife and a multitude of young children. The anniversary of the end of World War I is a fitting day to remember those brave men and women, many of whom gave so very much for the sake of our people and our principles.